Edwin George Hardy was born in Preston Plucknett on 27 October 1886, the son of Edwin Thomas Hardy (1861-1921), an engine driver at a glove factory, and Mary Ann née Brown (1862-1937). By the time of the 1891 census Edwin and Mary were living at Yeovil Marsh with their children; William Thomas (b 1883), Ann (b 1885), 4-year old Edwin and Henry (b 1889). By 1901 the family had moved back into Yeovil and were living at 10 Victoria Road. 14-year old Edwin gave his occupation as an errand boy for a laundress. Edwin enlisted in the army at Yeovil and, from his Service Number 9076 of the Worcestershire Regiment, it appears that this was towards the end of 1904. Although Edwin's Service Record has him in the 3rd Battalion, Worcestershire Regiment (which remained in England between 1904 and 1910), he was certainly attached to the 2nd Battalion and saw service in India - indeed the 1911 census records him with the 2nd in India. In the trooping season of 1912/1913 the 1st and 2nd Battalions exchanged roles, the 2nd Battalion coming home from India and the 1st Battalion proceeding overseas. The transport “Rewa” took the Battalion home, and on 5 March 1913 the 2nd Battalion landed at Southampton. In the early summer of 1914 Edwin married Bessie Whitehead at Wincanton. The order for mobilisation was received at Aldershot on the evening of 4 August 1914 and during the ensuing week all ranks of the 2nd Battalion Worcestershire were busily employed in completing their preparations for War. The Battalion had to be filled up to war strength by reservists, weapons had to be made ready, equipment and ammunition received and issued, stores of all kinds taken into use. Officers and men had to be medically inspected and passed fit for service, additional horses had to be received and taken over, regimental property had to be placed in safe keeping. During the second week in August the mobilization was completed. Then for some days the Battalions stood fast awaiting orders. Early on the morning of 13 August the 2nd Battalion marched down to the Government siding at Aldershot and entrained. The two trains which carried the Battalion left Aldershot at 7am and 8am respectively and three hours later arrived at Southampton Docks. The two half-battalions were embarked on board the transports "Lake Michigan" and "Herschel." In the afternoon of the following day the transports came into Boulogne. Early on 21 August the 2nd Worcestershire marched via Etreux to La Groise. There for the first time the Battalion had to find outposts - on the bridge at Catillon over the River Sambre. At 1am on 23 August the Battalion was roused and assembled in the dark, only to spend a long hour waiting in the road while other troops got into position. Before dawn, the Division moved off, crossed the Belgian frontier and marched through Malplaquet. They arrived at Bougnies shortly after midday and heard for the first time the distant thunder of guns. Whether or not Edwin was in the 2nd Battalion or the 3rd Battalion of the Worcesters, he fought in the Battle of Mons and at Le Cateau and both Battalions were involved in the Battle of the Marne. Following the Allied victory at the Battle of the Marne in mid-September 1914, the German forces retreated to the high ground of the Chemin des Dames ridge on the north bank of the River Aisne. As they moved northward, the Germans were closely pursued by units of the British Expeditionary Force (BEF) and their French allies. The first British troops crossed the Aisne at Venizel on the evening of 12 September, and Allied units crossed at different points along the river over the course of the next day. By the early hours of 14 September British and French troops had formed bridgeheads at several points on the north bank of the river and were preparing to attack. The Allied intention was to advance north toward Laon, capture the heights, and force the German armies to continue their retreat. Allied commanders were unaware of the real strength of the enemy forces on the Chemin des Dames ridge, but it soon became clear that the German units had dug trenches, were supported by heavy artillery, and intended to stand and fight. By nightfall on 14 September, British units on the north bank of the river had been ordered to dig trenches and reinforce their positions, which now spanned a twenty-mile front. Although the Battle of the Aisne continued for another ten days, neither side could claim a decisive victory; the German forces failing to drive the Allies back across the river, and the Allies unable to push the Germans from the ridge. This ‘stabilization’ of the front marked the beginning of trench warfare – a grueling stalemate that would last for almost four years. Edwin, a soldier for ten years, was killed in action during this day-to-day trench warfare at Vailly-sur-Aisne on 20 September 1914 - just a month after war was declared. He was aged 28. On 15 March 1915 the Western Gazette reported "Official intimation has been received by Mrs Hardy, of Castle Cary, of the death of her husband, Private Edwin Hardy, who was serving with the at the Front. Private Hardy, whose mother and father reside at 24 Victoria Road, Yeovil, went to the Continent on the outbreak of war, and was in the engagement at Mons. He was killed in action on 20 September last at Vailly." 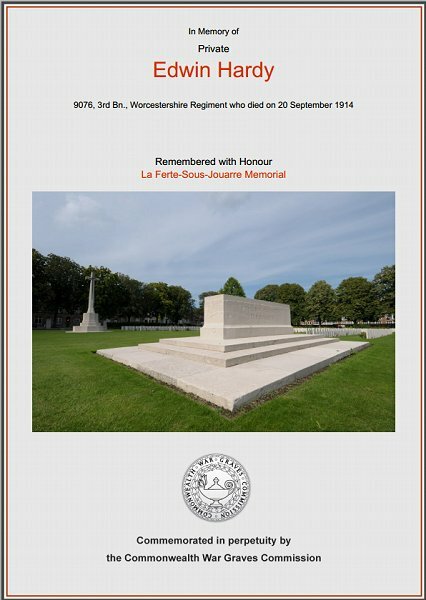 Edwin's name is inscribed on the La Ferte-Sous-Jouarre Memorial, Seine-et-Marne, France, and his name is recorded on the War Memorial in the Borough. On 19 February 1917 Edwin's 27-year old younger brother, Henry Charles, died from his wounds in France. His name is also recorded on the War Memorial in the Borough - albeit incorrectly inscribed Hardy, BG rather than Hardy EG. The Commonwealth War Graves Commission certificate in memory of Edwin Hardy.